Events where Canadian Reindeer are in Inuvik to be a part of the ‘Muskrat Jamboree’ celebration of Spring AND also events at Reindeer Station 50 km north of Inuvik. This with the help of Arctic reindeer herding youth from around the Arctic. 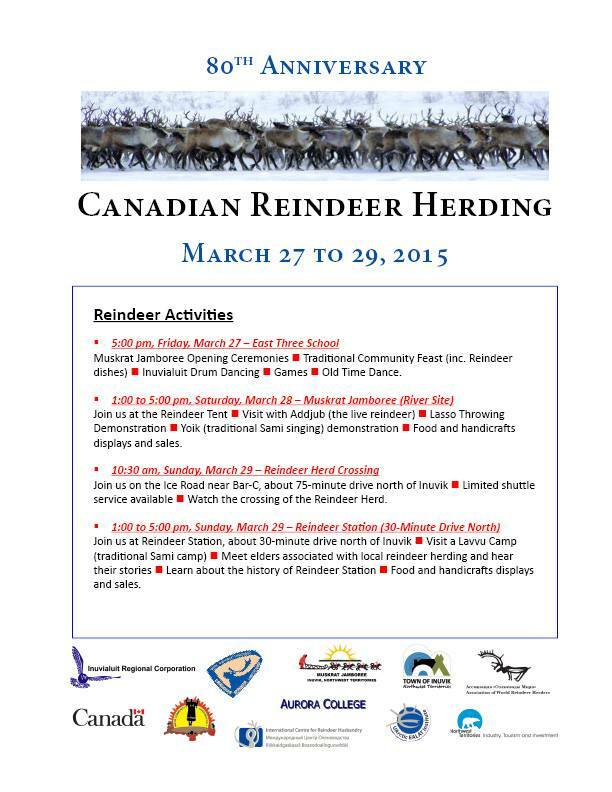 – Crossing the Ice – reindeer on migration to summer grazing on Richards Island : March 29 2015 / Time :10-30 -11:15 AM. At km 105 on Inuvik > Tuk ice road. Road will be closed from 10:30 – 11:30 AM between Bar C and Lucas Point. – various events in Inuvik where Arctic Reindeer Herders join in the celebrations = reindeer meat cook-off challenge / lasso contest and more.